And we’re back for round two of the 15 books I read in August. Also, here was round one if you missed it. 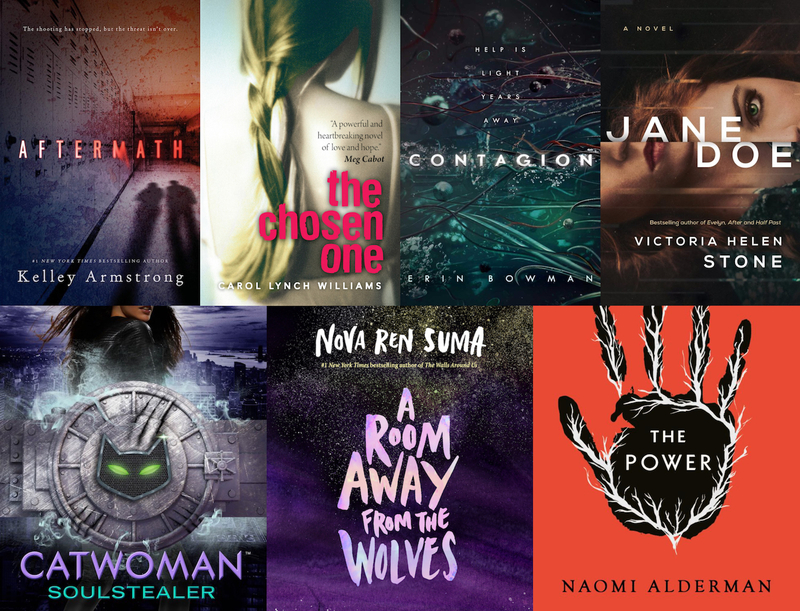 This roundup includes a pretty eclectic mix of contemporary, science fiction, mystery, superhero and magical realism in both YA and adult formats. Want to know more? WELL YOU’RE IN LUCK, my reviews are write below this sentence! 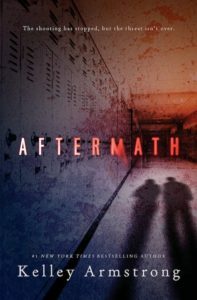 Aftermath by Kelley Armstrong takes place three years after a school shooting, and Skye is the younger sister of one of the shooters. She hasn’t talked to her former best friend, Jesse, since the shooting–his brother was one of the victims. Skye is forced to move back to her hometown and attend school with Jesse, where she encounters a lot of bullying and including somebody who wants her to think she doesn’t really know what happened the day of the shooting. Aftermath focuses on the characters and the mystery of what happened, with some romance mixed in. It’s a really emotional subject matter, especially given the events of the past year, but Armstrong tackles it thoughtfully. Skye and Jesse weren’t at the school that had the shooting, so the book isn’t about what it’s like to live through that, but rather, losing somebody close to you because of such an event (or having that person be responsible). I will basically read any book Kelley Armstrong publishes (except her Women of the Otherworld series, because that’s just a lot of books…), and she definitely kept me turning the pages with this one. That said, there are so incompetent police and the events towards the end do get a bit over-the-top and cheesy. Still, as always, Armstrong creates really strong characters, and more than the mystery, that’s what really stands out in this book. Skye’s mix of shame and loss were really powerfully written. Overall, Aftermath was an emotional read and I am looking forward to whatever Armstrong writes next. I’ve had a copy of The Chosen One by Carol Lynch Williams on my bookshelves for years, and the topic always intrigued me, and the book is pretty short (~200 pages) but somehow I never managed to read it. So this August while I was on vacation I decided to borrow the audiobook, which is also really short (~5.5 hours), and finally give it a listen. The Chosen One is told from the perspective of Kyra, a 13-year-old girl who lives in an isolated community with her large family, including her mom, her dad, and her dad’s other two wives for a total of 20 brothers and sisters. Kyra finds her escape in books she secretly borrows from the mobile library, but when the Prophet declares Kyra must marry her sixty-year-old uncle, she has to make a decision that will change her life, and the lives of her family, forever. 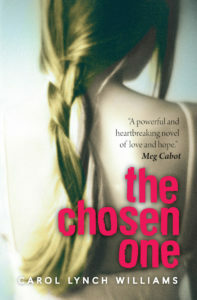 The Chosen One is an intense and emotional story, with so much jam-packed into a pretty short novel. It felt like Williams did a great job capturing Kyra’s perspective, she was very easy to connect to and I just wanted things to turn out well for her. Kyra’s inner conflict over her life, where there were no easy choices, was expertly captured. Despite the struggles Kyra went through, there were also moments of joy with her sisters, and those were quite powerful as well. The minor complaint I have is that for somebody so isolated, Kyra seemed to have some convenient knowledge about the outside world. That said, Williams did an excellent job with this short yet impactful story. The audiobook narrator was also great. Ultimately, after finally reading The Chosen One I’m not only wondering why I didn’t read it sooner, but what else of Williams I can pick up next. I definitely had a space-ship shaped hole in my reading life after finishing the Illuminae Files series, and that’s exactly what I was looking to fill with Contagion by Erin Bowman, about a team that answers a distress call on another planet, only to discover that almost everyone is dead. The story is actually more Alien than Illuminae, and although it’s a YA novel it features an ensemble of characters that are mostly not teenagers, including a scientist, her intern, a young captain, a temporary pilot, a mechanic, and a few other characters helping out with the mission. 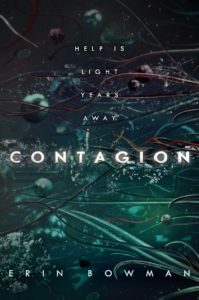 Contagion often switches points-of-view and I found the audiobook confusing and difficult to listen to, but once I switched to a hard copy and made it through the first 100 pages, I was able to really enjoy the story. While there’s a lot of information to share at the beginning of Contagion, I thought that overall the pacing was great and Bowman does an excellent job bringing the creepy, empty planet to life. It can be a struggle to connect with any particular character when there are so many in a book, and while there were plenty I didn’t really care about here, I really appreciated and enjoyed Thea’s (the intern) perspective. I also love whenever a book includes a scientist. Contagion‘s ending is fantastic but also a pretty brutal cliffhanger and I definitely plan to pick up the sequel, Immunity, when it releases in 2019. Quick, easy thrillers are basically my perfect vacation read, which is exactly when I picked up Jane Doe by Victoria Helen Stone, a novel about Jane, a woman who is pretending to be somebody else so that she can exact revenge on Steven. Steven hurt somebody Jane loved, so she’s going to hurt him back. Badly. 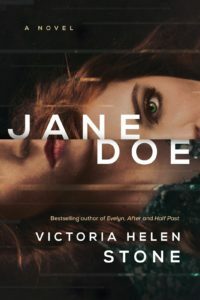 Jane Doe is a pretty straightforward but intriguing story, filled with some scenes which made me not surprised to learn Stone also writes romance novels (under the name Victoria Dahl). Jane is a self-diagnosed sociopath, which means she doesn’t have the same moral concerns other people might, and gives her the ability to be ruthless about what she does. I really enjoyed Jane’s voice, especially her strength and confidence, but I wish there had been more depth and history shared about her character. The bad guys in Jane Doe are also fairly simple, there’s definitely no hesitation about them being pretty bad people. I also felt like the ending was too easy. That said, there were some fun moments, and I think my favourite relationship in the book was the one Jane had with her cat. Overall, it’s very easy to keep turning the pages in Jane Doe so if you’re looking for a fun, fast-paced thriller I do recommend picking this one up. 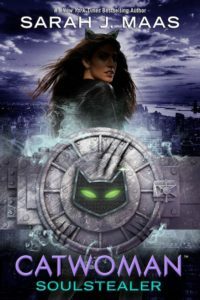 Catwoman: Soulstealer by Sarah J. Maas is the third book in the DC Icons series, following Wonder Woman (reviewed here) and Batman (reviewed here), although there is no actually connection between the different books since each features different characters–kinda a missed opportunity I think. Catwoman is the story of Selina Kyle, who fights to earn money for her younger sister’s meds, but when she’s given an offer she can’t refuse, she leaves Gotham City for two years only to return as the mysterious and wealthy Holly Vanderhees. With Batman away on a mission, Selina/Holly/Catwoman teams up with Poison Ivy and Harley Quinn, but can Luke Fox/Batwing stop them from taking whatever they want from Gotham City? For this superhero series I really enjoy sticking with the audiobook format, which I think gives me a higher tolerance for some of the cheese and predictability because the audiobook narrator (In this case, Julia Whelan, one of my favourite narrators) does such a great job. Catwoman has better pacing and character development than Batman but doesn’t manage the complexity and originality of Wonder Woman. My favourite part of the book was Poison Ivy, a botanist who was experimented on and wants to save the world from humans. Is it too much to hope she gets her own book? This is my first experience with cult-favourite Maas’s writing, which had great pacing and I loved the team of girls beating up everyone. The main issue was despite having passages from his perspective, Batwing never really had the depth of the other characters, and Batman’s weird absence just felt out of place and never properly explained (maybe there will be a sequel?). The story is also very predictable. I definitely have no idea how close to the original this Catwoman retelling is, but it’s a fun read. That said, if you’re only going to pick up one book from this series, I still recommend reaching for Wonder Woman instead. 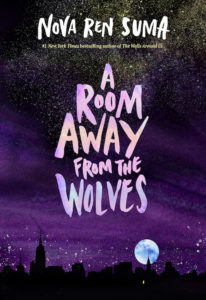 I absolutely adored A Room Away From The Wolves by Nova Ren Suma. Want to know more? Check out my review from the blog tour here. 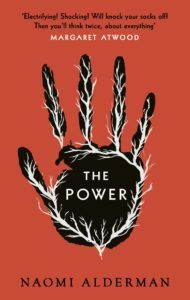 The Power by Naomi Alderman was a recommendation from a good friend of mine whose trust I taste but somehow I never manage to read the books she tells me to, so I decided to change that this time, and I’m definitely glad I did. This is a dystopian novel told from four perspectives about a future world where girls suddenly have the ability (or power) to generate electricity using their “skein” (a bundle of nerves across their collarbones) with the results varying from mild to death. I listened to the audiobook of The Power and it was definitely uncomfortable to listen to; I honestly wouldn’t say I enjoyed this book, but it is a fascinating and important read. One of my favourite aspects of it was the fact that it’s actually a book within a book, so it begins and ends with letters between Alderman and a male author which I thought really added impact to the book. All four of the points-of-view had unique and interesting perspectives but I especially loved Roxy, who is part of an English crime family and has the most powerful skein. Overall, The Power is a very memorable book and worthy of discussion, I think it would be a really excellent pick for a classroom or bookclub because it certainly leaves a lot to discuss. Success, I actually managed to wrap up my August reads before September is over! Have you picked up any the books I’ve shared in this post? Let me know if you’ve read anything you love lately!